The cross drilled version of the Black Diamond brake disc range is designed to increase cooling of the disc. The holes drilled in the disc allow more air to flow in and over the disc which in turn helps reduce heat build up which reduces brake fade. The black heat treated coating is designed to prevent corrosion and improve appearance. 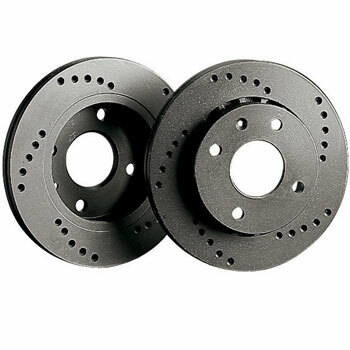 Black Diamond cross-drilled brake discs are very popular for fast road and semi track day use!